Demonic horror can be profoundly unsettling, but it largely validates a Christian (particularly Catholic) framework of good and evil. After all, William Peter Blatty is admirably serious about his Catholic faith. 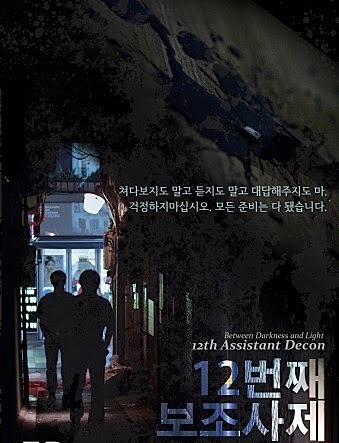 While it definitely follows in the thematic tradition of The Exorcist, Jang Jae-hyun gives the possession horror story a distinctly Korean identity in 12th Assistant Deacon, which screens during the 2015 Stanley Film Festival. Father Kim is determined to exorcise the demon possessing comatose teenager Young-shin. If he can liberate her spirit, her body might start responding as well. Tragically, the demon is particularly cruel and belligerent. Despite his repeated efforts, many of his appointed assistants have been scared off by its mocking torments. Yes, it is safe to say Deacon Choi has more than ten predecessors. To his credit, he has deep faith and can pray in multiple languages, but he too has painful memories the evil one will exploit. On the surface level, 12th Assistant resembles any number of possession films, but its atmosphere and execution are considerably superior. It gets decidedly tense, but what really sets the film apart is its unequivocal embrace of faith and spiritual resiliency. Father Kim explicitly argues the darkness they witness necessarily implies the existence of the light. He is quite convincing, in the context of the film. Park Ji-il is absolutely terrific as the battle-hardened Father Kim. He handles the surprisingly impressive special effects scenes quite well and completely nails his big speech. Likewise, Lee Hak-joo hits all the right notes as the earnest but unprepared deacon. This is one of the rare films Catholics, Evangelicals, and cult film connoisseurs can enjoy in equal measure. Its depiction of demon-exorcising Catholic clergy is particularly interesting, considering it was produced in South Korea, where Christianity is the largest organized religion. Yet nearly half the country is agnostic and many regard Christianity with suspicion or worse. That thorny dynamic is directly reflected in Father Kim’s complex interactions with Young-shin’s very different parents. It is a serious film, but also seriously scary. Highly recommended for horror fans, 12th Assistant Deacon screens this Friday (5/1) as part of Short Program II, at this year’s Stanley Film Festival.